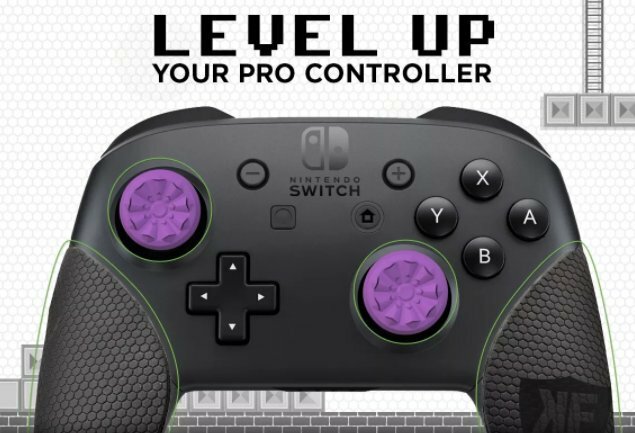 As stated in a recent press release from the company, KontrolFreek will be launching a series of Switch-focused gaming accessories on October 24. These accessories include the company's new KontrolFreek Turbo thumbsticks, which offer both 4.4mm height and 83% more surface area to the Nintendo Switch Joy-Con thumbsticks. Two color options will be available, both blue and red, and the company has stated that they were designed for use in games like Mario Kart 8 Deluxe, Super Mario Oddyssey, The Legend of Zelda: Breath of the Wild, and the Switch's most competitive-minded shooter, Splatoon 2. Also launching will be KontrolFreek's popular FPS Freek thumbsticks, in this case ones specially designed for the Nintendo Switch Pro Controller. Discerning thumbstick fans will be able to pick these up in the company's Inferno, Galaxy, and CQC Signature designs, each of which offering varying amounts of thumbstick height for increased precision. Players will also be able to scoop up KontrolFreek's Tempered Glass Screen Protector in the off-chance they wanted added protection and a glass-like feel for the Switch's screen, as well as the company's Performance Grips that add another layer of grip to the Switch Pro Controller. Though no specific prices were given, KontrolFreek has stated that all of these accessories will vary in cost from $9.99 to $14.99, and players will be able to find them at major global retailers like GameStop and JB Hi-Fi, where they can also pre-order the accessories ahead of their October release date. Be sure to check out Modojo's Best Accessories page to discover more great add-ons for everything from mobile phones to the Nintendo 3DS.